Hooray for the lo-fi fruit tart, with pastry rolled out by a gin bottle and no need for tart pans or pie dishes. Because almost all my kitchen equipment is in storage, I made this pastry with nothing more complicated than a cheese grater. And the result is such a simple marriage of taste: sweet strawberries, buttery pastry. Like all fruit pies, it's best eaten hot with something creamy and cold. I look back at the time when I never made my own pie and tart crusts because I thought you needed a food processor to do it, and think sadly of everything I missed out on. One day, yes, I'll buy a food processor (one day when I stop moving every 7 or 8 months, which will be very soon), but won't it be nice to know I can do all this by hand if I want to? I do recommend a rolling pin over a gin bottle, however, even when it's a beautiful brown Hendrick's one (alas, empty of gin). I know I can manage thinner pastry and neater edges than these, but at the same time, the point of a free-form pie is to look artless and comfy. I make pastry by freezing the butter, still in stick form, and then grating it while frozen on the larger round holes of a cheese grater. Lately I've been using the pâte brisée recipe on Simply Recipes; I've re-written it here only to give instructions for making it by hand. To use a food processor, follow the link to the recipe on Elise's site. To make the pastry: grate the butter on the larger round holes of a cheese grater. Return the grated butter to the freezer for 20 minutes or so, to chill again. In a large bowl, combine flour, salt and sugar. Add frozen, grated buter and work into the dry ingredients very briefly with your hands. Some of the flakes of butter should stay large, and others will be incorporated into the flour; you want it to reach the texture of oatmeal, and pieces of butter should still be visible in the finished pastry (that's what makes it so flaky when cooked). Add the ice water one tablespoon at a time, mixing very briefly between tablespoons. If you pinch some of the crumbly dough and it holds together, it's ready, if not, add a little more water and pulse again. You may not need to use all 4 tablespoons of water. Remove dough from bowl and place on a clean surface. Carefully shape into a disc. Don't over-knead; it just needs to come together enough to hold a circular shape. Sprinkle the disc with a little flour on all sides. Wrap it in plastic wrap and refrigerate at least 1 hour. 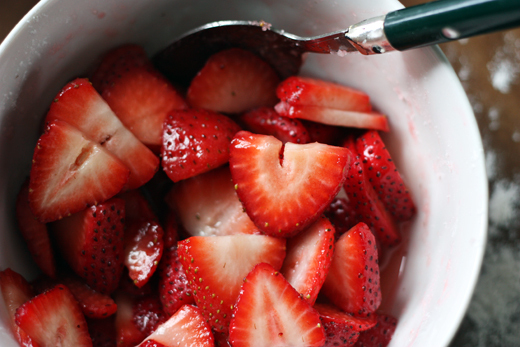 Macerate the strawberries: remove the leaves from the strawberries, then slice. Place them in a bowl with the sugar and cornflour, squeeze over a little lemon juice, and stir everything together. Leave for half an hour to an hour, until the strawberries are sitting in lots of pink, sugary juice. Preheat the oven to 375°F/190°C. Line a baking tray/cookie tin with baking paper. 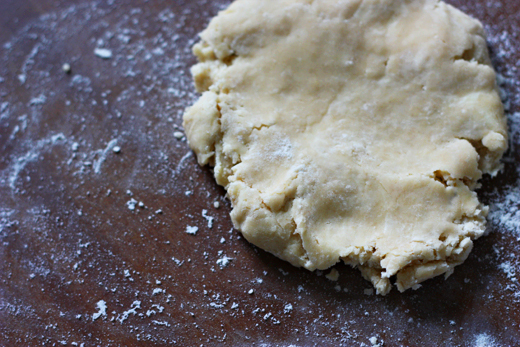 Remove the pastry from the fridge and let it sit for 5 to 10 minutes, until it's easy to roll out. On a clean, floured surface, roll the pastry into a rough circle, about 1/8 inch thick (about 3 mm). (If, like me, you're making 2 small pies, divide the pastry in 2 and roll separately.) I found it easiest to transfer the rolled out pastry onto the baking tray at this point. Put the strawberries in a pile in the middle of the pastry circle, bringing as little of their juice with them as possible*, and leaving a border of about 3 inches around the edges for a large pie, or 1.5 inches for 2 smaller ones. 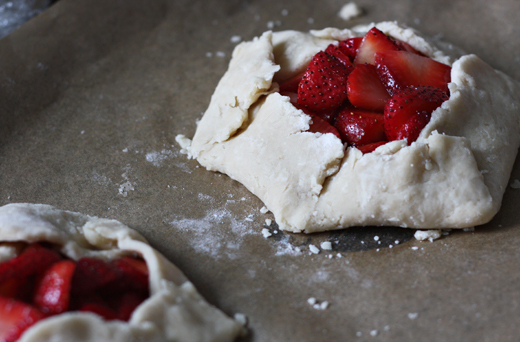 Fold the pastry up around the strawberries, pleating as you go, so that a central area of fruit remains uncovered. Press down on the pastry folds to stop them from separating in the oven. Sprinkle the pastry with a little sugar, and dot the top of the strawberries with a little butter, no more than half a tablespoon. Bake for 25-30 minutes, until the pastry is golden. Serve warm with vanilla ice cream or thick cream. The juice will have bubbled up and run down the sides the sides of the galette, so be careful when lifting and serving. * The strawberries will produce lots of juice while baking, so don't put any extra into the pie. I stirred the leftover juice into Greek yoghurt. This is a great idea for the strawberries I've got sitting in my refrigerator right now. Also, I'd like to point the awesomeness and utility of gin bottles. I think I should start giving this as the excuse to keep purchasing my gin - I need it to bake with! These are so beautiful. I especially like the first photograph with the text. So lovely and rustic. I haven't mastered tart/pie dough but I'm going to try this method. A scrumptious-looking dessert with a very small ingredient list, I like! How many strawberries did you use? 2 pints was exactly double the amount I needed. The first I made turned out reasonably well, but for some reason the pastry "fell apart" after taking it out of the freezer, and wouldn't come together with a rolling pin (vodka bottle)so I had to use my hands... resulting in the butter melting... resulting in a toughish pastry. You don't need a food processor to make pie dough! Get a pastry blender for like 5 bucks, they're designed to cut up cold (not frozen!) butter. Just toss the butter into the flour cut up in large chunks (I cut it into Tb-size slices) and then go at it with the pastry blender till all the butter is pea-sized. Hi, and thanks for your comment on pastry blenders. I used one for many years, and I agree - they're great for keeping warm hands off butter while you're incorporating it with the flour. I've come to prefer the frozen butter/grating method because I find it faster, which means colder butter. It's worth trying different methods, though, to see which works best for you. And I definitely agree that you don't need a food processor! Hi Luke - I wish I could be more helpful, but I suspect that with pastry it's a matter of practise. You'll start to get a sense of what flour/water ratio looks right (and remember that will change depending on humidity etc). It's frustrating that something that needs to be so precise is so impossible to prescribe! If you link through to the website I've taken this pastry recipe from, Simply Recipes, there are some good suggestions in the comments (including people recording their struggles) that you might find helpful. I do recommend a proper rolling pin rather than a vodka bottle, though (and you know I say this with no judgment, because I made mine with a gin bottle!). A cheap one will make a difference - any pastry will be easier to work with. beautiful! i made a shitake, goat cheese, onion, asparagus galette in early spring! Just made these for Sunday tea. Luscious! i've tried it myself and it is really good! the extra strawberries and the strawberry juice i used it to make strawberry jam. 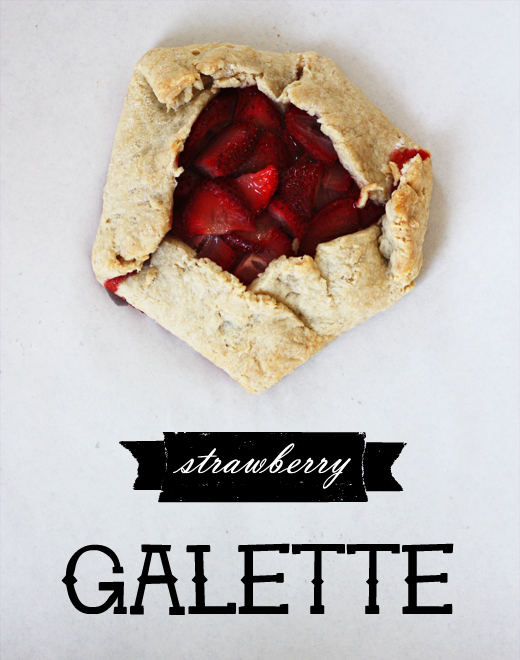 strawberry jam with the galette taste really good!